Like Little Eva, the talents of Dione La Rue, better known as Dee Dee Sharp, got chained to a parade of zippy dance records. Although her run of success ended up being greater in terms of hit records in comparison to Little Eva, it did lock her into being a Teenage Dance Queen with a far more mature voice and a desire to move to more adult material. On her 70th Birthday we take a look at where she was in the waning days of 1965 around her 20th Birthday 50 years ago. As often happens in combination with fame and work, romance starts to burble up in places where performers, writers and producers hang out. Given the limited time all those parties have for socializing, quite often coupling happens. So it should come as no surprise that Dee Dee Sharp, getting to know up and coming producer Kenny Gamble, found herself liking more than his songwriting ability. 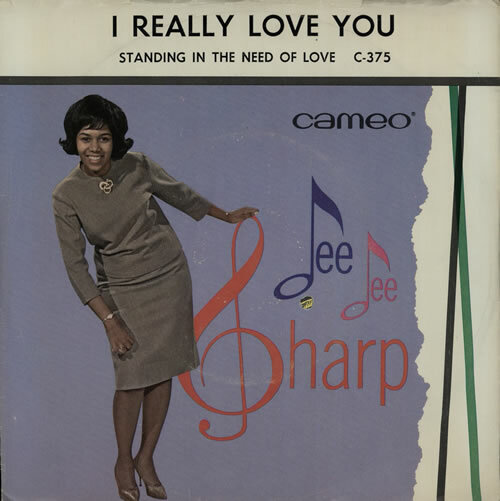 Gamble had initially wrote a B-side (“He’s No Ordinary Guy”) for Dee Dee in early 1964 and became, with partner Leon Huff, one of the advocates for moving her away from simple dance hall favorite to more complex material worth her ability and range. It came into full fruition by the Summer of ’65 with her last charted single for Cameo-Parkway. Towering, elegant, with harps and high flying strings, this long standing Lowrider Oldies classic pointed Dee Dee decidedly away from the dance floor, and out the door from the faltering Cameo-Parkway on the arms of Kenny Gamble to Atlantic records in 1966. Sadly, despite the initial joy in romantic partnership between the two, success proved elusive for Dee Dee for the remainder of her recording career, despite fine efforts for the next 15 years.